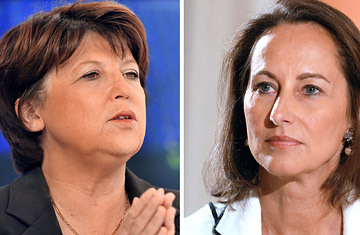 Socialist Mayor of the northern French city of Lille Martine Aubry, Left, and former presidential candidate Segolene Royal. Nearly 12 hours after the 137,000 PS members began voting in the run-off round for the party's top job, officials announced Lille mayor Martine Aubry had beaten last year's defeated presidential candidate, Ségolène Royal, by a tiny 42-vote margin. The statistical slimness of that outcome  50.02% to 49.98%  was all the more remarkable following early returns that showed Royal firmly ahead. Though that initial lead mirrored Royal's dominant position after Thursday's first round, it was a surprise given the subsequent regrouping of factional forces that clearly favored Aubry in the run-off. Little wonder, then, that PS heavyweights backing Royal reacted with considerable swagger to her quick start in the final. Not only would their candidate win the leadership job, Royal supporters promised in the early hours of Saturday; she also looked set to triumph in near landslide proportions of 53% to 55%. Given that strutting, it wasn't surprising that the final tally announced at 5 a.m. Saturday left the Royal camp incredulous and outraged. "It's impossible for results to be declared tonight," responded royaliste Manuel Valls, mayor of the Paris suburb Evry after the official count was published. Indeed, referring to the reversal in early voting trends  and echoing the routine accusations of "irregularities" that arise during any internal PS polling  Valls repeatedly spoke of "cheating" before making the comment that has many observers now calling the Socialists' central Paris headquarters "la Floride-sur-Seine." "We won't allow victory to be stolen," Valls pledged. Yet it will be very difficult for Royal supporters to obtain any Floridian-style recounts  much less win an entirely new vote. That means Aubry, a former Labor and Social Affairs minister and architect of France's now-defunct 35 hour work-week, becomes the first female leader in PS history. Her objective in that post: constructing a Socialist platform rooted in more traditionally leftist policies to win back voters who flocked to Green and Communist parties after years of the PS's centrist drift. She then hopes to build a coalition of all leftist parties to finally mount a challenge to nearly a decade of unbroken national dominance by conservatives. In reality, Aubry, 58, is less the dour, doctrinaire Socialist she's positioned herself to be in contrast to the relaxed pragmatism and image-driven reputation for modernity and change characteristic of Royal. Still, even if Aubry's main differences with Royal, 55, are largely about style rather than political orientation or objective, she's proven to be just as polarizing as her rival. That means the tight result will find Aubry trying to lead just as many PS members who love her as those who hate her with a passion. "The first real problem for Martine Aubry will be that she'll be facing a deeply split party, and won't have a big majority or resounding mandate to back her up when challenged," says Pascal Perrineau, director for the Center for Study of French Political Life in Paris. "The second problem is, Ségolène Royal is a very determined and strong politician who believes she's the person to lead the PS back to national power. She won't simply fold up her plans and projects, sit down, and be quiet."